We just had an earthquake offshore of Colima, Mexico. 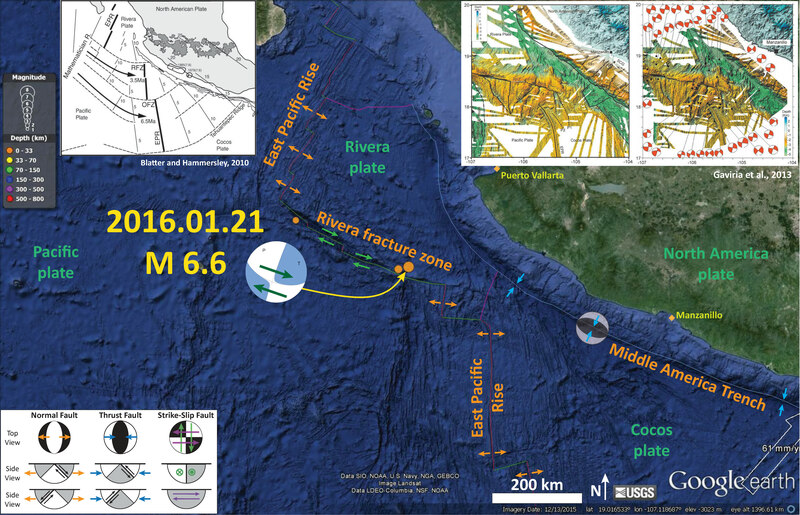 This earthquake appears associated with the Rivera fracture zone (RFZ), a transform plate boundary separating the Rivera plate to the north and the Pacific plate to the south. The RFZ connects segments of the East Pacific Rise, the oceanic spreading center where the Pacific plate, Rivera plate, and Cocos plate are formed. The RFZ is a system of stepped right lateral strike-slip faults. There is likely zero risk of a tsunami from this strike-slip earthquake. Here is the USGS web site for this earthquake. Below is a map showing the regional tectonics. I made this using Google Earth ™. The seismicity from the last 30 days (USGS feed) is plotted vs. depth (color, see legend on left). Based on the location of this earthquake (adjacent to the RFZ), I interpret this to be a right lateral (dextral) strike slip earthquake. I plate some inset maps to help with the tectonic interpretation from Blatter and Hammersley (2010) and Gaviria et al. (2013). 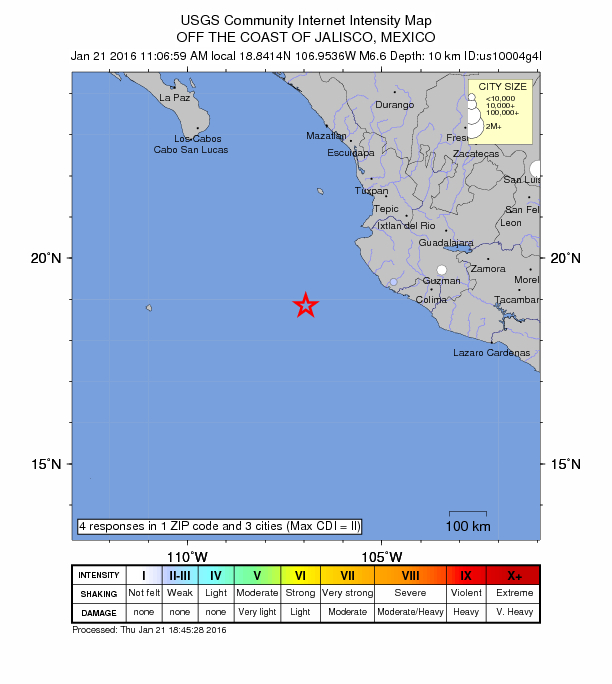 This earthquake was not felt much in Mexico, based upon these USGS “Did You Feel It?” reports. Gaviria et al. (2013) use magnetic anomalies to interpret the very complicated tectonics at the eastern part of the RFZ. Here is their plate tectonic map. This map includes focal mechanisms for earthquakes in the region. This helps them interpret the faulting. Here is their figure showing the bathymetry of the region, along with their interpretation of where different fault systems are. Here is the linework showing just the anomalies and faults. This map shows their interpretation for the development of the plate boundary from 3-1 Ma. Blatter, D.L. and Hammersley, L., 2010. Impact of the Orozco Fracture Zone on the central Mexican Volcanic Belt in Journal of Volcanology and Geothermal Research, v. 197, no. 1-4, p. 67-84.